Fish Oil is one of those things that I know I SHOULD be taking as a supplement since I don't eat actual fish, but I always slack off on doing. I'm not crazy about taking pills, especially fish oil capsules because they usually have a bad aftertaste. Blech! While I was in NYC earlier this month, I received a bottle of Nature Made Fish Oil Adult Gummies from the Mom Select Swag Suite. They had samples and I almost didn't try one because I thought "Yuck, fish oil." But, I was surprised when I tried it and it tasted exactly how it looked - like a tangy fruit candy. I took the bottle home and tried them again and same thing - nice and fruity and NO fishy after taste! 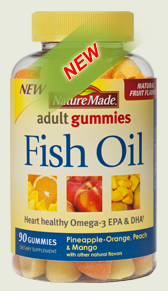 From the info on the Nature Made web site, "Nature Made Fish Oil Adult Gummies contain 68.5 mg of Omega-3s per serving, including EPA and DHA to help support a healthy heart." I'm happy to know that I now have a source to easily get the Omega-3s that are lacking in my diet - - and even get a tangy treat when I'm doing it! If you want to try them yourself, you can save $2 with a printable Nature Made Adult Gummies coupon.